Damask Duo delight audiences with their vibrant, varied and virtuosic performances. They weave spoken programme notes throughout their concerts in a friendly and engaging manner. Rosie and Sarah often incorporate music related to destinations on the ship’s itinerary, whether it be the UK, Europe, Asia or the Americas. They are currently rehearsing an English and Scottish programme for a cruise to Scotland. The duo met whilst performing in theatrical pop orchestra The Irrepressibles, playing at concert halls and festivals all over the world. They have been playing chamber music together and as Damask Duo for 5 years. Rosie is a freelance flute player based in London and has performed at many venues in the city including the Royal Festival Hall, Queen Elizabeth Hall, the Barbican, and at top hotels such as The Dorchester. Rosie has toured in England and across Europe with pop/performance art orchestra The Irrepressibles, and recorded on their debut album Mirror Mirror. She loves playing classical chamber music, musical theatre and pop; she has recorded at Air studios and BBC Maida Vale, played with big bands and in musical theatre pit bands. Rosie plays in flute & harp duo Affinity for recitals and functions and loves playing with the Damask flute & piano duo on cruises. A cruise highlight was performing on P&O Aurora for the 175th Anniversary Grand Event Cruise. Alongside her performing career Rosie is a flute and woodwind teacher at schools in Hampstead and Kew. She conducts New End School orchestra and enjoys coaching on junior music ensemble courses. Since graduating from Birmingham Conservatoire with a first class degree Sarah has been in constant demand as both soloist and accompanist. Throughout her career she has worked with the City of Birmingham Symphony Orchestra, Birmingham Opera Company, Birmingham Royal Ballet, London Symphony Chorus, The Opera Group and has performed in prestigious venues such as The Barbican, Queen Elizabeth Hall, Symphony Hall Birmingham, and Bridgewater Hall in Manchester. A versatile musician, Sarah is also a singer, performer and composer. She performs with a cult theatrical pop orchestra known as The Irrepressibles who have performed all over the world in concert halls as well as music and arts festivals. Her composition work has brought many commissions in the theatre world, particularly her adaptations of Shakespeare sonnets. A sumptuous selection of light and uplifting flute & piano music with the Damask Duo, Rosie Reed and Sarah Kershaw. Enjoy Elgar’s charming Chanson de Matin and Salut D’Amour, Fantasia on Greensleeves, Annie’s Song and music by Frank Bridge and Handel. The Damask Duo will tickle your taste buds with popular themes from Carmen, The Nutcracker and The Magic Flute. Relax to the Flower Duet from Lakmé, take a dip into Moon River by Mancini and spot the TV advert! 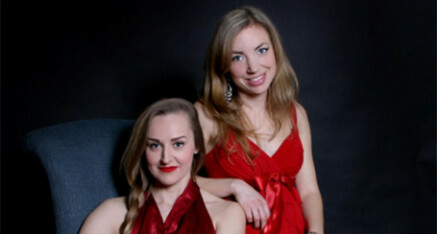 Rosie Reed – flute, Sarah Kershaw – piano. Prepare to be mesmerised as the Damask Duo, Rosie Reed (flute) and Sarah Kershaw (piano), take you on an enchanting journey through exotic influences in classical music. Sit back and unwind to Bizet’s Pearl Fishers’ Duet, Mozart’s Rondo Alla Turca, Rimsky-Korsakov’s Chanson Arabe and music from Japan, China and the South Pacific. An uplifting voyage of flute and piano music beginning in Europe with Gounod’s beautiful Ave Maria, Grieg’s Norwegian Dance and the Spanish Sevilla by Albeniz, before setting sail across the Atlantic to Brazil and America for music by Abreu, Joplin and Gershwin.